Why are we interested in your property? Adobe Oil & Gas, Inc. is a family owned investment partnership that purchases oil and gas minerals and royalties throughout the United States. AOG is currently located in eight states. We recognize the many issues which might encourage the divestiture of Oil and Gas interests. An Estate settlement, Family stewardship changes and optimizing return during market swings are all excellent reasons to monetize your land deeds or Royalty ownership. 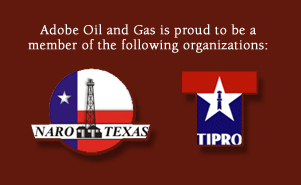 Adobe Oil and Gas has a long history of acquiring properties of all sizes. As a result, we are always interested in the purchase all or a portion of the perpetual mineral interest, royalty interest, or overriding royalty interest (ie. oil and gas income free of expenses) and non- producing minerals. Recognizing the historical swings that Oil and Gas pricing experiences, the interests are priced by providing a fair multiple of monthly income.